Beets are rich in skin enhancing nutrients and they have some rather surprising beauty benefits. The powerful antioxidants present in beets are exceptional for anti-aging and skin rejuvenation. Just dab the beetroot juice on your face using cotton balls to get perfect glowing skin. Drinking beetroot juice on the regular basis helps you to get rid of the acne and gives you a glowing skin. Quality of the hair can be improved by carotenoids from beets, or you can use beets to get rid of dandruff. Beets improve skin complexion by whitening your skin tone and removing blemishes or dark circles under eyes. Beetroot juice contains natural pigments that make a good hair dye, and can make you be a readhead naturally without damaging your hair. Using beetroot juice for dyeing of hair is a lot cheaper and less damaging than getting a salon toner. If you’ve dreamed of naturally glowing, radiant skin with a kiss of blush on the cheeks, you can try to make, and use, you own natural blush. The beet blush is easy to make and makes you feel good about what you are putting on your skin. 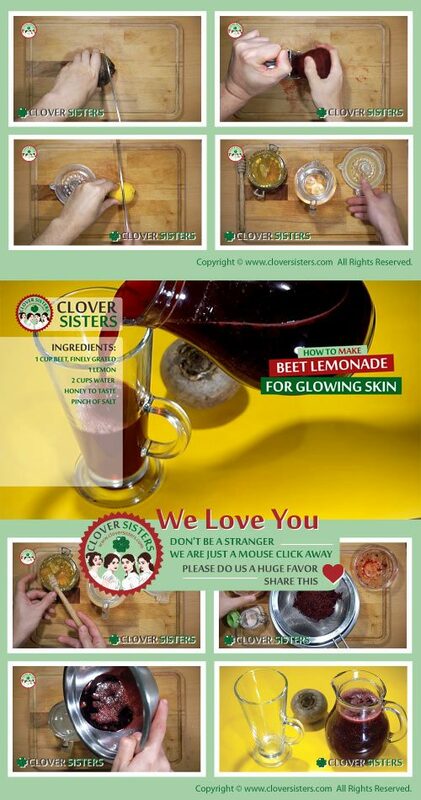 Beet lemonade is hands down my favorite natural beauty ingredient, which is essential for healthy skin. You can easily achieve a naturally glowing skin by adding a beetroot lemonade and its detoxifying effect to your everyday diet. Prepare finely grated beet, about one cup, add pinch of salt, and leave it to ‘sweat’. Prepare lemonade of one lemon, 2 cups of water and honey to taste. Then add the strained beet juice. Use it daily.